7 Rest in Yahweh, and wait patiently for him. Don’t fret because of him who prospers in his way, because of the man who makes wicked plots happen. 8 Cease from anger, and forsake wrath. Don’t fret, it leads only to evildoing. 9 For evildoers shall be cut off, but those who wait for Yahweh shall inherit the land. This is a call to rest and wait. In the culture that we live in, these are two of the most difficult things that we can do. Hebrews 4 speaks of a Sabbath rest that God wants us to enter into where we cease from our own works and enter into His rest. While this promise seems simple enough to accomplish, there is something in the human heart that struggles to truly rest. I am not talking about having a siesta or taking a vacation, but a rest in the very core of our hearts where we cease from all striving. When we come to the place of learning to rest in the very center of our being, we will cease from our own human initiatives and position ourselves to simply wait for the Lord to work on our behalf. This is not a place of passivity because we have to work at entering into this place of rest. We will only allow ourselves to enter into this place when we are convinced that we no longer have to strive to find acceptance in the loving embrace of our God and Father. In my opinion, to truly learn to rest and wait patiently for the Lord is one of the highest forms of trust that we can demonstrate. It is in this place that we realize that we don't have to protect ourselves, provide for ourselves, initiate for ourselves, etc., because we have a God who is head over heels in love with us and He has promised to work on our behalf. All He asks is that we learn to rest and wait patiently for Him. 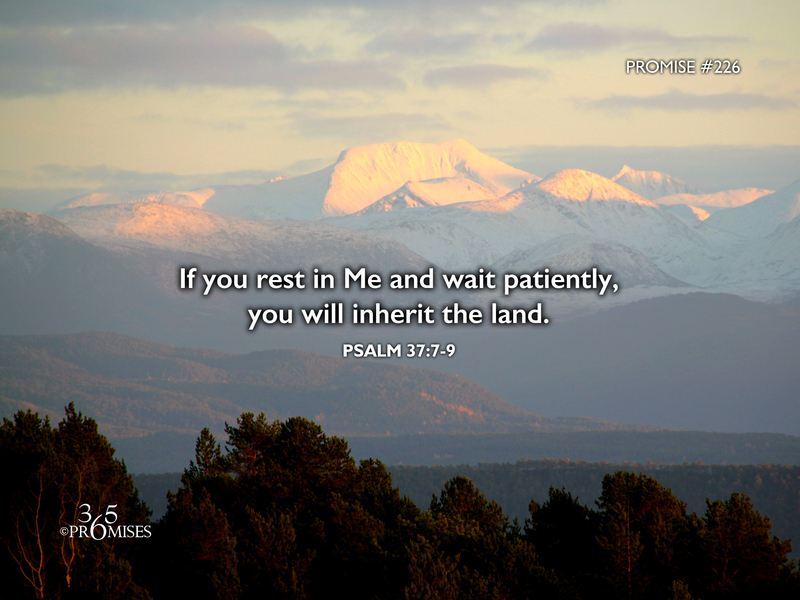 Today's promise says that when we do, we will inherit the land! Not because of anything that we do, but because of the goodness of our Heavenly Dad. May the Holy Spirit show each one of us how we can more fully enter into that place of rest and trust so that we can wait on the Lord and see our inheritance released.